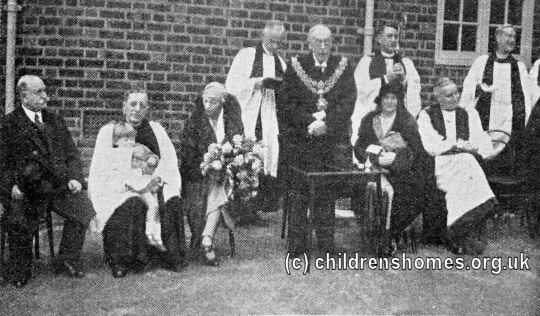 The St Christopher's Home for babies and toddlers was opened by the Waifs and Strays Society in 1931 at 252 Warwick Road, Olton, near Birmingham. Its location is shown on the 1937 map below. St Christopher's Home site, Birmingham, c.1937. Half of the home's construction costs had been raised over a six-year period by the Midland Waifs and Strays League, better known as the 'Waif-aiders'. The building was designed by Messrs. Dallas and Lloyd, the latter — Bernard M. Lloyd — having been a keen supporter of the Society for many years. The home was officially opened on December 16th, 1932, by the Duchess of Beaufort, with a ceremony of dedication conducted by the Bishop of Birmingham. The home could accommodate up to 50 children who were usually admitted as babies and moved on to other homes at around the age of four. At the outbreak of the Second World War in 1939, the home was evacuated to Huntley Manor in Gloucestershire, returning to Olton in 1945. In 1972, the home's intake was extended to include children of junior school age. In 1978, the home began accommodating children with physical disabilities, including Down's syndrome and cerebral palsy. From 1980, children with learning difficulties were also housed at St Christopher's. In 1990, the home became St Christopher's Home For Multi-disabled Children, readying young people for independent living. The former St Christopher's buildings have now been demolished and modern flats now occupy the site.